During a typical combustion cycle in your heavy-duty Mack® truck’s diesel engine, thousands of controlled explosions are generated to give your truck the power it needs to charge ahead. These explosions pack a lot of heat, with combustion chamber temperatures easily reaching 4,000 degrees Fahrenheit. Your truck’s engine needs a specially formulated coolant to absorb damaging heat and keep temperature-related problems at bay. Not just any one will do – approximately 40 percent of heavy-duty vehicle downtime comes from poor coolant or poor maintenance. Lower-quality coolant requires supplemental coolant additives, or SCAs, to cut down on corrosion, cavitation and hard water scaling. But adding too many SCAs over time can force silicates and phosphates out of solution, creating green goo that can clog filters and engine components and prevent heat from transferring. That could mean more downtime and expensive repairs. Designed specifically for Mack engines, Mack Extended Life Coolant, or ELC, gives you the most powerful cooling system protection for your truck. 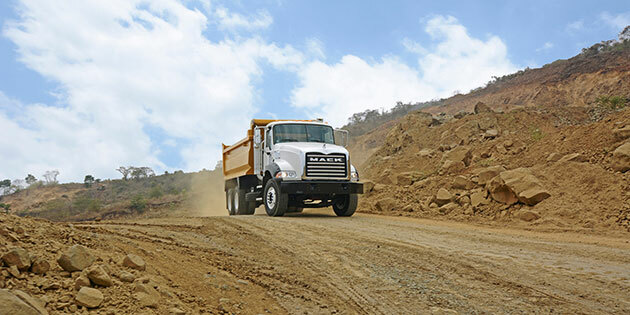 With Mack ELC, no SCAs are required. Mack ELC uses advanced carboxylate technology to reinforce weak spots in the piston lining, preventing further destruction without additives or extenders. And it’s formulated to flow freely inside the cylinder liner, drawing heat away from critical engine components. But even if you’re using the best coolant for your truck, you can’t just fill it once and rely on the occasional top-off to keep your engine running strong. Your maintenance program should include testing the freeze point of your coolant with a refractometer to make sure it contains the recommended ratio of 50 percent coolant, 50 percent distilled or deionized water. More extreme ratios can negatively affect your engine’s heat exchange capabilities and put additional stress on critical cooling system components. The factory-trained Mack technicians at your nearest Mack Trucks dealership can conduct this test twice a year. They’ll also check your coolant at every preventive maintenance visit, not only to top it off if needed, but also for signs of changing colors or odors that might indicate problems. With proper care and maintenance, Mack ELC can provide service life of up to 750,000 miles. Both Mack ELC and Road Choice’s full line of high-quality, value-priced extended life coolants can be ordered 24/7 through the SELECT Part Store™, so be sure to sign up today for quick delivery and deep discounts.